The decisive battles that led to the creation of the Republic of Armenia in 1918 had several professional officers among their leaders. Taniel Bek-Pirumian came from a region that gave many military leaders throughout history: Artsakh (Gharabagh). He was born on November 21, 1861, in the village of Nakhichevanik, in the district of Khachen. He graduated from the city lyceum of Shushi, then capital of Artsakh, and started his military service at the age of twenty. He studied at the infantry lyceum of Tiflis from 1881-1883. Three decades later, in 1913, he graduated from the courses of the school of artillery of Oranienbaum (nowadays Lomonosov, in the region of St. Petersburg, Russia). Meanwhile, he ascended in the ranks of the Russian army: sergeant in 1883, lieutenant in 1888, captain in 1890, and deputy colonel in 1913. He held positions as commander of squad, platoon, and battalion. Pirumian fought at the Caucasian front in the Russian army during World War I. He was ascended to the rank of colonel in 1915 and decorated with several medals for his bravery. Like many of his colleagues, Pirumian remained in the region after the evacuation of Russian troops following the October Revolution of 1917, helping organize the nascent Armenian army. In the decisive days of May 1918, Taniel Bek-Pirumian was entrusted with the general command of the front of Sardarabad, which was dangerously close to Etchmiadzin. On May 21, the Ottoman forces occupied the village and the railway station of Sardarabad, and advanced towards Ghamishlu. The next day, the battalion of the “Condemned to Death” (մահապարտների գունդ) of Gharabagh, headed by Poghos Bek-Pirumian (first cousin to Taniel), counterattacked and chased away the Ottoman troops up to Sardarabad, which was liberated in the late afternoon. The Ottomans fortified themselves in the surrounding heights and led a counteroffensive on May 24-26. The three-day battle was fiercely contested and ended in an Armenian victory. In those delicate moments, Taniel Bek-Pirumian’s military experience and his iron will played a fundamental role. He entered the fraught of the battle, leaving the command to Lieutenant Alexandre Chnéour, a Russian officer in the Armenian army. Personally heading a column of soldiers, he disrupted and repelled the Turkish advance in the central area of the battlefront. 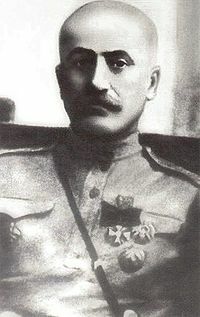 Bek-Pirumian continued his career in the Republic of Armenia and was ascended to the rank of major-general in late 1919. He was appointed military commander of Kars. However, he broke his leg in a car accident, and was taken prisoner by the Turks in October 1920 after the fall of Kars. In January 1921 he was transported to Alexandropol and delivered to the representatives of the 11 th Red Army. The Bolshevik terror was rampant in newly sovietized Armenia. In 1921, soon after being liberated from Turkish prison, Bek-Pirumian and other high-ranking Armenian officers were shot on the road of Gharakilise (nowadays Vanadzor) to Dilijan. The corpse of the unfortunate general was secretly moved to Etchmiadzin and buried in the cemetery of the church of St. Gayane. Another hero of Sardarabad, his cousin Poghos Bek-Pirumian, overwhelmed by the Bolshevik terror, took his own life. Sympathies for the Armenian plight and cause were not a rare issue in Europe, frequently born from humanitarian concerns. One of those cases was that of Italian diplomat and historian Giacomo Gorrini. 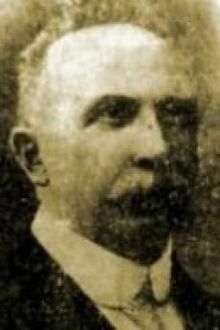 Gorrini was born in Molino dei Torti, near Alessandria, on November 12, 1859. He graduated from the Scientific-Literary Academy of Milan in 1882 with a degree in literature and philosophy, and, after a competition, he entered the two-year advanced course at the Institute of Higher Studies in Florence. In 1884 he published his dissertation, Il comune astigiano e la sua storiografia. Saggio storico-critico (The Commune of Asti and Its Historiography: Historical-Critical Study). After studying for a year at Berlin University, in 1886 he won the concourse for the position of director of the Archives of the Ministry of Foreign Affairs. For more than twenty years, Gorrini worked in the organization of the archives and published several collections of documents, as well as books and articles of his own derived from his work as a historical consultant. His initial interest in Armenians was reflected in a short study entitled Antichi diritti di casa Savoja sopra l'Armenia (Ancient Rights of the Savoia House over Armenia, 1895), where he outlined the relations between Armenia and the Italian ruling dynasty, and also made reference to Rome and Venice as “remarkable centers of Armenian culture and civilization.” His academic workload did not prevent him from continuing his studies. He obtained a second degree in law from the University of Napoli (1892) and a habilitation to teach modern history from the Institute of Higher Studies in Florence (1894) and the University of Rome (1900). In 1897 he became member of the Higher Council of the State and Kingdom Archives, where he would remain for almost forty years. In November 1909 Gorrini was designated Italian consul in Trebizonda, but took his new position in September 1910. For the next five years—except for a hiatus due to the Italian-Turkish war of 1911-1912—he was actively involved in the promotion and teaching of the Italian language and the development of commercial initiatives. His reports followed the situation in the region, and also made reference to Armenians and Kurds, and their relations with the central government in Constantinople. Italy was neutral at the beginning of World War I, but the worsening of relations between Italy and Turkey forced Gorrini to leave his post on July 23, 1915. He would reach Rome on August 19, two days before Italy declared war to the Ottoman Empire. The influential daily Il Messaggero published an interview with the former Italian consul on August 25, 1915, which was published in an English translation in Viscount James Bryce’s and Arnold Toynbee’s Blue Book in 1916. Gorrini was among the first witnesses to give a first-hand account of the massacres and deportations already carried out by the Ottoman government. The interview, revealed his horror and compassion for the victims. He returned to the Foreign Service, where he executed diverse and delicate administrative tasks until 1919. He reached the rank of general consul in November 1919 and departed to Trebizond for a short mission in April 1920 to close his consular activities, which had been cut short five years before. Upon his return, he was informed of his new destination as Italian representative in Yerevan, the capital of the Republic of Armenia. However, due to the political situation, he only reached Yerevan in April 1921, when the Soviet regime had already been installed. In June 1921 he obtained some railway and mineral concessions from the Soviet Armenian government and returned to Italy for consultations. However, he was ill with malaria and remained in Rome, where he still worked for two more years, until his retirement in January 1923. He nevertheless continued his archival and academic work, and he also contributed scholarly articles and commentaries to newspapers and journals. He also continued supporting the Armenian Cause. In 1940, at the age of eighty, he published the book Armenia. Testimonianze (Armenia: Testimonies) on the anniversary of the first Armenian independence. He supported the right of the Armenians to an independent homeland, which was inscribed within a future redrawing of the Mediterranean territories according to the imperial goals of Benito Mussolini’s Italy. Giacomo Gorrini passed away in Rome on October 31, 1950, at the age of ninety-one. Soil from his tomb was deposited in the “Memory Wall” of the memorial complex of Dzidznergapert, in Yerevan, on May 25, 2001. During the first half of the twentieth century, it might be said that the field of Armenian Studies was built upon a quartet of pillars in the fields of philology and history: Stepan Malkhasiants (1857-1947), Manuk Abeghian (1865-1944), Nicholas Adontz (1871-1942), and Hakob Manandian (1873-1952). 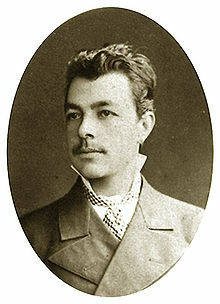 Stepan Malkhasiants was born on November 7, 1857, in Akhaltskha (Javakhk, now in Georgia). After finishing the Armenian parochial school and the Russian provincial school of the town, in 1874 he entered the newly opened Kevorkian Lyceum of Vagharshapat, which depended on the Holy See of Etchmiadzin. Upon graduation in 1878, he pursued higher education at the Faculty of Oriental Studies of the Imperial University of St. Petersburg. He graduated in 1889 with a doctorate in Philology, specialized in Armenian, Sanskrit, and Georgian. In 1885, still a university student, he published a critical edition of tenth century Armenian historian Asoghik’s Universal History. Two years later, he published his translation of William Shakespeare’s King Lear, directly from the English. In 1892 he would publish a translation of Macbeth . From 1890-1910 Malkhasiants worked as a teacher at the Nersisian School of Tiflis, where he also was principal from 1903-1906. Meantime, he married Satenik Benklian. During those two decades, he published important studies about the Armenian language and orthography, as well as ancient literature, such as The History of Sebeos and Movses Khorenatsi (1893) and Study of the History of Pavstos Buzand (1896). He also published, in collaboration, a critical edition of Ghazar Parpetsi’s History of the Armenians (1904). He was an active contributor to the Armenian press in the Caucasus, particularly the journal Ararat of Holy Etchmiadzin and the daily Mshak of Tiflis. Malkhasiants continued his educational work in Tiflis during the 1910s, when he was principal of the Hovnanian girls’ school (1910-1914). Then he accepted an offer as principal of the Kevorkian Lyceum in Vagharshapat (1914-1915), but when the lyceum was closed in 1917, he returned to Tiflis and became principal of the Gayanian School. In 1917 Malkhasiants was one of the founders of the Armenian Popular Party, which in 1921 would become one of the founding parties of the Armenian Democratic Liberal (Ramgavar Azadagan ) Party. He moved to Armenia in 1919, and taught for a year at the primer university opened in Alexandropol (nowadays Gyumri). His report to the National Council (Parliament) of Armenia became the basis for the adoption of the tricolor flag of the Republic of Armenia (1918-1920), which would be re-established after 1991. He had the honor of presenting the opening lecture at Yerevan State University on February 1, 1920. Malkhasiants continued his scholarly activities during Soviet times. In the last decade of his life, he published an impressive number of studies: the Russian translation of Sebeos’ History of Heraclius (1939), a critical edition of the medical treatise of Amirdovlat Amasiatsi (1420-1496), the Modern Armenian translation of Movses Khorenatsi’s History of Armenia, and a monograph, On the Enigma of Khorenatsi, all in 1940, and the Modern Armenian translation of Pavstos Buzand’s History of Armenia (1947). In 1940 he received a title of doctor honoris causa, and in 1943 he was elected member of the founding body of the Armenian Academy of Sciences. Malkhasiants’ name, however, has become synonymous with his monumental Armenian Explanatory Dictionary (1944-1945), a four-volume work of 2380 pages in three columns, which he compiled between 1921 and 1943. This dictionary was unprecedented in the history of Armenian lexicography, as it included the lexicon of Classical, Middle, and Modern Armenian, old and new loanwords, and many dialectal terms, with a total of 120,000 entries. It gave the grammatical definition of each word, synonyms and antonyms, and examples for most terms. The dictionary became a fundamental source for all dictionaries of the Armenian language and bilingual dictionaries published afterwards in Armenian and abroad. It won the State Prize of the Soviet Union (called Stalin Prize at the time) in 1946, and it was reprinted three times (Beirut, 1956; Teheran, 1982; Yerevan, 2008). An interesting feature is that it was printed in classical orthography upon Malkhasiants’ insistence. The prolific scholar passed away on July 21, 1947, at the age of ninety.